We attempted to find the ballast bags’ displacement by measuring the bags, finding the area of the end face, then multiplying area by the bags’ depth to find cubic volume. With cubic volume, we could figure how many gallons of water the bags hold, then just multiply by the weight per gallon of seawater to determine each bag’s ballast weight. 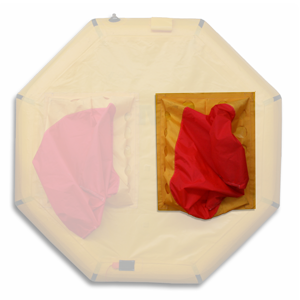 This life raft’s ballast bag has triangular end faces. Flat side panels connect the triangular ends to form the SuperRev ballast bags. The raft is equipped with two identical bags. Revere describes these as double 200 lb. ballast bags. The nomenclature suggests the bags provide 200 pounds of ballast each. For reference, here are the approximate measurements of the ballast bags on this life raft for two. 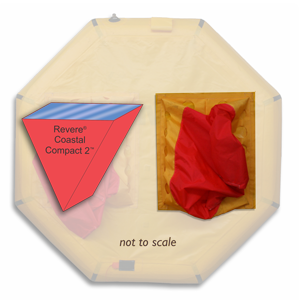 The Coastal Compact 2 for two persons has two water ballast bags which provide about 65 kg or 143 pounds of ballast each. Total water ballast from the two bags is about 130 kg or 286 pounds. 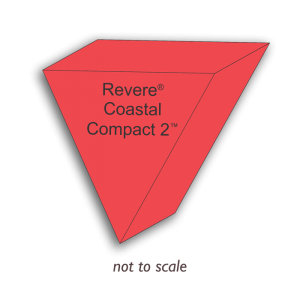 The Revere Coastal Compact 2, does not provide 400 pounds of water ballast, whatever we make of the double 200 lbs description. 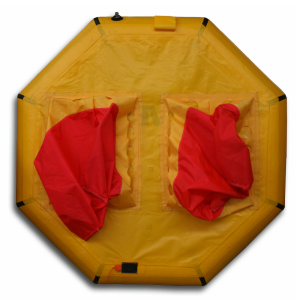 Other models of the Coastal Compact life raft may be different! 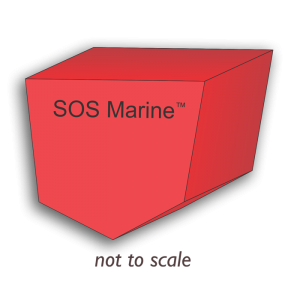 Shown at left, the SOS Marine ballast bag end face has a more complex shape. It appears to be a rectangle or trapezoid with an adjacent triangular section below. The 2 man coastal life raft from SOS Marine has three of these bags, so we will multiply by three to find total water ballast provided. Here are the approximate dimensions of this ballast bag; all three have the same dimensions. 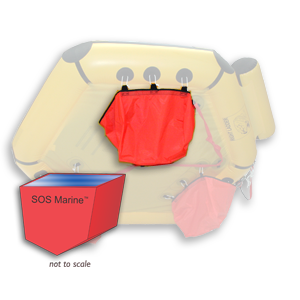 The 2 man coastal life raft from SOS Marine has three water ballast bags which provide about 42 kg or 93 pounds of ballast each. Total water ballast from the three bags is about 127 kg or 280 pounds. 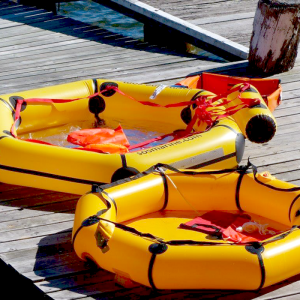 Water ballast is an interesting concept for the bottom of life rafts. Ballast bags do not provide the dynamic stability created by opposing forces of keel weight and hull flotation, because ballast bags weigh hardly more than the seawater they contain. When the raft sits quietly in the water, the bags provide essentially zero ballast. But the moment any force acts upon the raft, to lift it out of the water, water weight contained within the ballast bags holds the life raft down to the water’s surface. In this respect, ballast bags provide on–demand stabilization. 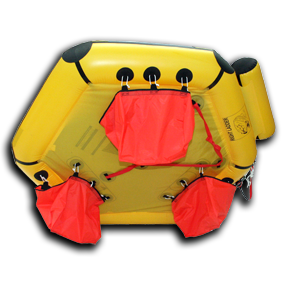 The Revere Coastal Compact 2 life raft has two double 200 lb. SuperRev ballast bags which provide a total of 286 pounds of water ballast. 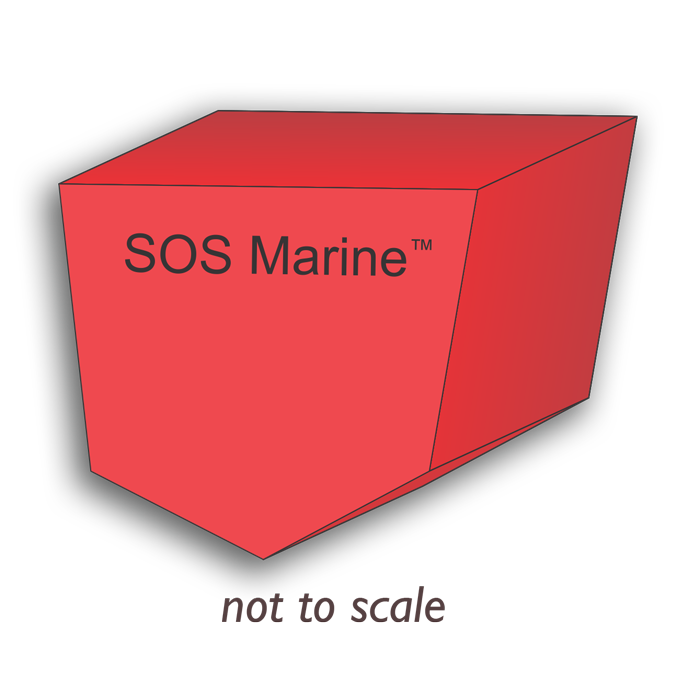 The SOS Marine 2 man coastal life raft has three ballast bags which provide a total of 280 pounds of water ballast. 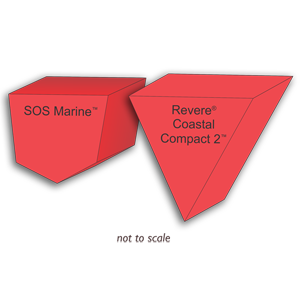 The Coastal Compact 2 bags are oriented at 180 degrees from each other whereas the SOS Marine bags are oriented at 120 degrees from each other. 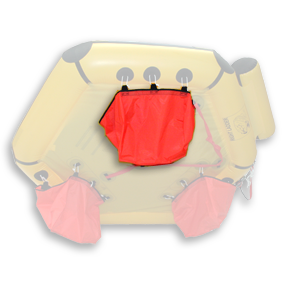 One side of the SOS Marine ballast bags attaches to the outer flotation tube, placing ballast closer to the edge of the life raft compared to the Revere Coastal Compact 2, on which the ballast bags are attached to the life raft floor, inboard of the flotation tubes. Click to a complete feature–by–feature two man coastal life comparison of these rafts. 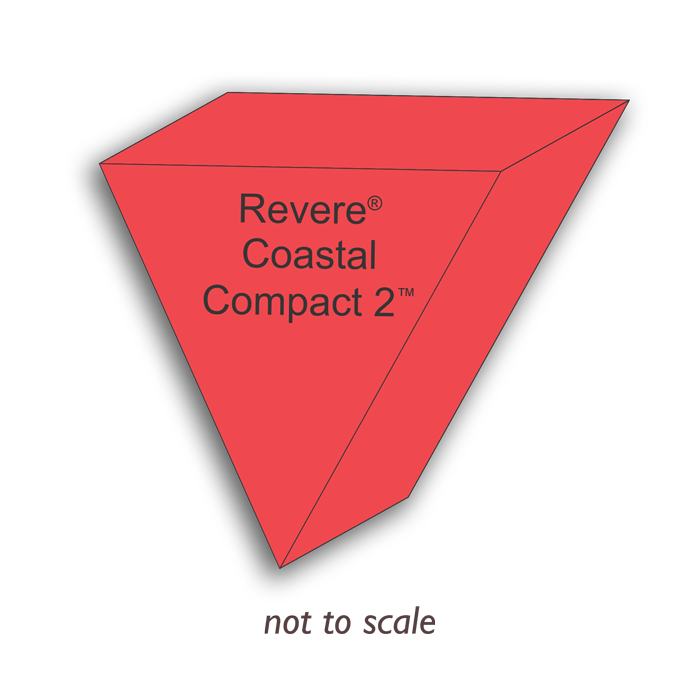 Revere, Coastal Compact, Coastal Compact 2, Coastal Compact 2 Valise, and SuperRev are property of Revere Supply Company, Inc. and/or Revere Survival Inc. The terms are used here under fair use because no other suitable terms exist to portray the exact product and manufacturer evaluated. This entry was posted in Survival Raft and tagged ballast bags, coastal life raft, comparison by Philip Thompson. Bookmark the permalink.